www.stb806.de The last glacial period occurred from the period c. 115,000 – c. 11,700 years ago. Erratic boulders, till, drumlins, eskers, fjords, kettle lakes, moraines, etc., are typical features left behind by glaciers which make it possible to reconstruct the ice coverage during the last Ice Age. Many of today’s countries were entirely covered by thick ice sheets for thousands of years. These countries include Iceland, Ireland, Norway, Sweden, Finland, Estonia, Latvia, and Lithuania. 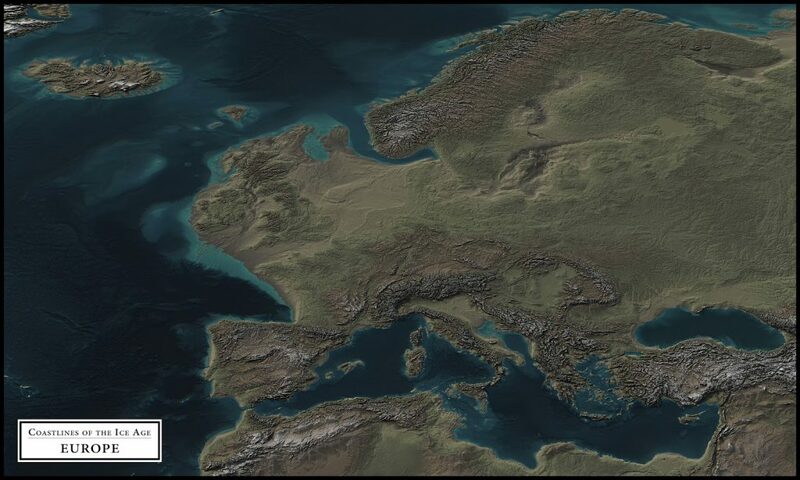 The big Scandinavian and British ice sheet extended south as far as northern Poland and Germany while also covering almost all of Denmark. At the same time in the eastern regions, the ice spread into the territory of Russia (about 300km west from Moscow) and some northern parts of Belarus. In the west, ice covered almost the entire British Isles, leaving just a relatively small ice-free zone in the south of the United Kingdom. Today, about three-quarters of all the world’s freshwater (14,9 million km2) is stored in glaciers, while during the last Ice Age it was about 3 times more (44,4 Million km2). www.deviantart.com The source populations of Paleolithic humans survived the last glacial period in sparsely wooded areas and dispersed through areas of high primary productivity while avoiding dense forest cover.